When something traumatic happens to you, it can cause future similar situations to invoke fear and/or anxiety. I had a semi-successful FET, I got pregnant! But soon after lost the baby-to-be. Now my second FET is coming up so I’ve been looking for some reassurance that this time will be better! Disclaimer: This article is not meant as medical or any other type of advice. 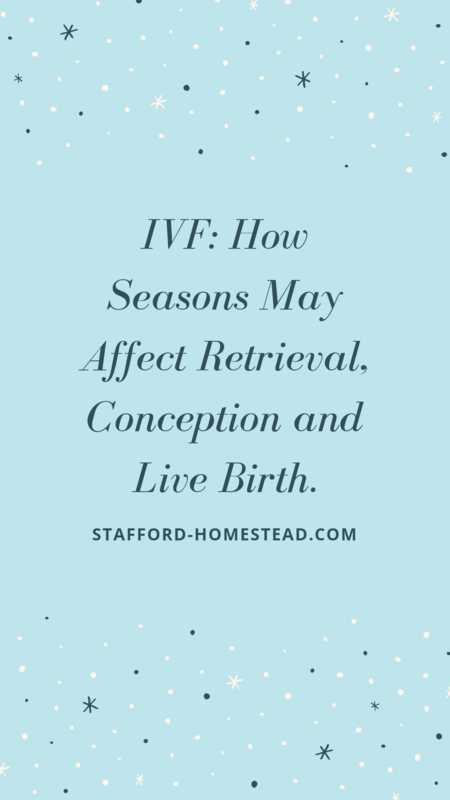 I had read in the past that fall/spring were better times to have retrievals/transfers and more likely to get pregnant. But was this true? This came from a typical “source” not a lot of science based proof but the idea did stick with me. I ignored this when it was finally time for me to have IVF. I had already waited more than half a year since seeing the RE & I wasn’t about to put it off longer because of some random post on the internet. This seed of thought popped back into my head today, so I decided to dig a little deeper. As many of you may or may not be familiar with “Fertility and Sterility” or fertsert.org , this is the best site (in the US) that I know of for fertility/infertility based RESEARCH articles. These are peer reviewed studies that are published to help reproductive endocrinologist and the infertility community to see whats new with with research. Basically if you are looking for science-based proof if something works/doesn’t work or is effective or not this is the place to look. The study found that when WHITE women had retrievals in summer May-June their babies has 18% less chance of survival than if the retrieval/transfer, and shorter pregnancies (more preterm births) compared to in winter (November to February). (US based research). The inverse seemed to be true for Non-white women, June was the best month to have retrieval/transfer. The research suggests the environmental pesticides and vitamin D levels may be what is driving the lower success rates in the summer months for white women. There are also many articles regarding sperm quality and seasonal affects that I didn’t even begin to read.. there is a lot of info out there, many contradictions as well. What does this mean to you? For me, I wouldn’t not do IVF in the summer/winter because of the slightly higher risk of being unsuccessful, BUT if you get to plan your cycle and you don’t mind waiting, or if it happens to fall in during certain months, congrats because you just earned a slightly higher advantage (depending on what study you look at)!!! In infertility there is not much we can control, so I am constantly seeking out information that can put a positive spin on my situation. Sometimes research can support this, sometimes I turn to more spiritual/holistic practices to support positive emotions. Either way, I believe that its best to give yourself the benefit of the doubt and BELIEVE this cycle will work, and that you are doing YOUR BEST with the tools you have! Previous “Natural” FET #2: Transfer after Miscarriage.